The origin of primates was accompanied by increases in eye size and orbital convergence. These changes almost certainly occurred in a nocturnal lineage and likely functioned to improve image brightness and visual acuity in a nocturnal environment. The exact use to which this increased acuity was put cannot be determined from eye shape and size alone. Comparative studies of nonprimate mammals suggest that increased visual acuity was associated with increased auditory acuity as well (Heffner and Heffner, 1992). The changes in the visual system at the origin of primates were similar in kind to but less in degree than those that took place along the anthropoid stem lineage; i.e., anthropoids exhibit a further increase in orbital convergence, axial diameter of the eye, and visual acuity. 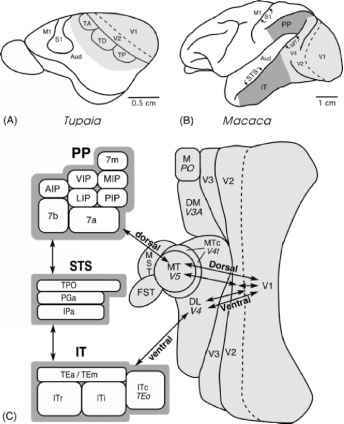 Selections for these changes in the anthropoid visual system are most likely to have occurred in the context of the changes in visual system anatomy put in place at the origin in primates.